Plastic-based, single-use, disposables has been prevalent in biotech/pharmaceutical manufacturing processes for decades. Examples of such technologies include filters, gaskets, tubing, sampling bags, carboys, and ultrafiltration/diafiltration (UF/DF) capsules. In recent years, single-use technology has made great leaps in broadening the range of options and applications available. Disposable bioprocess containers are now widely used for applications such as media/buffer preparation and storage, bioreactors and cell culture operations, in-process intermediate containers for manufacturing operations, final drug substance/product containers, and so on. Customized solutions are now readily available to the industry in the form of bioprocess containers with custom filters, tubing, fittings, and sampling assemblies. Because disposables are typically presterilized with gamma irradiation, they pose distinct, well-documented advantages over traditional stainless steel equipment. Some such advantages include reduced cleaning and steaming requirements before each batch, reduced risk of microbial and cross-product contamination, and faster turn-around times between batches, all of which provide for manufacturing flexibility (1). These advantages can reduce time to market in commercializing new drugs, as well as helping companies quickly release product batches after commercialization. As the emphasis on time to market increases, flexible manufacturing facilities are fast becoming the option of choice for the biopharmaceutical industry. Their extensive use of disposable technology is especially of interest to companies involved in multiproduct operations. Use of disposables reduces product carry-over risk from one batch to the next and allows for quick turn- around by reducing the need for carry-over testing. Depending on the scale and magnitude of operations, disposables may pose an economic edge over stainless steel equipment by lowering validation burden up front as well as reducing the need for utilities such as cleaning solutions and clean steam. Leachables and Extractables: A distinct area of concern with plastic-based, single-use technology is extractables and leachables (1, 2, 4, 9). Extractables are chemical entities released from plastic under exaggerated conditions of time and temperature using appropriate solvents. Such chemical entities may or may not enter product streams depending on the actual conditions of use in a manufacturing process. Leachables are released from plastics into a process stream under actual conditions of use. A subset of extractables, leachables are expected to be present because process solutions interact with plastic materials at specific process conditions. Those include temperature, duration of contact, pressure, and solution properties (pH, conductivity, chemical composition). Extractables and leachables can thus affect the quality of a product at various stages in its manufacturing process and/or end up in the final drug product, which can pose a risk to patient safety. So it is necessary to assess such risks as part of implementing disposable components. This topic is covered in the US Code of Federal Regulations and an FDA guidance on container–closures (4, 5). A risk-based approach to implementing disposables is recommended for all flexible facilities. A multistage approach aligns with the 2011 FDA process validation guidance (10). This approach includes three stages (as outlined below): process design, process qualification, and continued process verification. The approach is designed to seamlessly fit into existing programs that comply with the new guidance document. Up-front work identifies and establishes initial suitability of disposable components. After initial process definition, a vendor must be selected and disposable components identified. At this time, supplier quality agreements, audits, and change notification processes for disposable vendors should be established. During this stage, biomanufacturers often identify alternative vendors and options for disposables at specified steps in their processes. Because many ensuing studies take some time, it is advantageous to identify alternate vendors and options early on. Performing all studies on both the primary and alternate disposable options in parallel saves time. Initial assessment of suitability for disposable components includes evaluating vendor-provided data packages. USP compendial tests in Chapters <1>, <87>, <88>, <381>, <601>, <661>, and <1151> are commonly conducted. Other tests that may be considered include visual inspection; total organic carbon (TOC), conductivity, pH, nonvolatile organic compounds, semivolatile organic compounds, volatile organic compounds, and metals testing; gas, liquid, or inductively coupled plasma analytical chromatography with mass spectrometry (GC-MS, LC-MC, ICP-MS); and Fourier-transform infrared (FTIR) analysis. These studies provide qualitative and quantitative data on chemical entities that can be extracted from plastic materials at a range of conditions. The results can be used to establish acceptability of use for such materials in biopharmaceutical applications. Data resulting from those tests should be evaluated with actual manufacturing conditions in mind. It may be necessary to perform additional studies that simulate actual processing conditions and/or worst-case scenarios that can identify potential leachables to expect during routine processing. Some of the methods described above are used for such testing. All data from such tests should be evaluated in light of potential toxicity to patients. ICH documents on residual solvents and impurities provide some preliminary guidance to approaches to impurities (6,7,8). In actual assessments, however, users should take into consideration the point of use of a disposable component, product dosage form and amount, route of administration, and so on. e to those disposable components. A failure mode and effects analysis (FMEA) tool can help identify potential failure modes and their possible impacts to allow for assessment and prioritization of risks. The outcomes of these risk assessments can help define subsequent process development and characterization studies so that efforts at this stage are focused on high-risk factors and parameters. Later studies will aim to establish actual process conditions that will provide acceptable product quality at different stages in manufacturing. Introducing disposable components into a process validation cycle at this stage generates product quality data in their presence and allows for leachables testing. This provides for early detection of chemicalentities leaching into a process that could compromise patient safety. The amount and type of leachables coming from routine use of disposable components may depend on the duration of contact between process solutions and plastic materials. Thus it is necessary to investigate (as part of development and characterization studies) the impact of intermediate process hold steps in the manufacturing process. It may be necessary to simulate worst-case hold conditions in disposable containers. Biopharmaceutical manufacturing processes typically include purification techniques that are designed to be very specific to a product of interest. Techniques such as column chromatography and ultrafiltration can reduce potential leachables. Small-scale leachable-spiking studies can help reduce model leachables to drive down risk with disposables. During this initial stage, you should factor in time and effort required to put analytical techniques into place for testing and quantification of extractables and leachables. Depending on the type of tests performed, specific analytical qualification/validation studies may be needed. Commercial-scale engineering and development runs are typically performed at the end of process design to finalize commercial-scale parameters and ensure successful commercial operations in the future. Disposables used in the process are tested for proper facility fit and use during those runs. 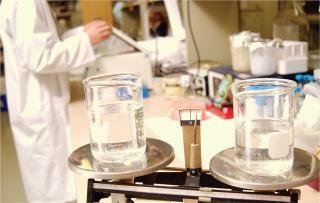 Extensive testing is also recommended to ensure success during process qualification studies. At the end of the process design stage, a final process definition (including all disposable components in the process) needs to be in place. Next, process knowledge gained during the process design stage is qualified through commercial-scale testing and evaluation of resulting data. Commercial-scale runs are based on the defined process established during process design, and testing is performed for various product quality attributes to establish a qualified process that is suitable for ongoing commercial manufacturing. In addition to extractable and leachable assessments, other elements come into play to establish suitability of use for disposables: product compatibility, microbial control studies, hold studies to establish acceptable hold durations, cell growth and protein production studies for disposable bioreactors, and so on. These assessments need to be supported by validation/qualification studies for suitability of use. For example, if a given disposable container is used for media storage, then its validation/qualification studies must demonstrate that over time media quality (microbial control or chemical stability) is not affected by the container. Such studies need to be appropriately incorporated into a process qualification program. Leachables testing should be performed at a number of steps in a process — as part of performance qualification runs — based on knowledge gained in the process design stage. Resulting data can be used to establish final suitability of use for all disposables in a process. Along with other knowledge gathered as part of the process validation life cycle, those data should be documented as part of a cumulative risk assessment for the entire manufacturing process. The assessment takes into consideration all individual component risk assessments performed during stage 1 in addition to the cumulative set of data gathered during stages 1 and 2. Data from intermediate hold studies and from leachables spiking and reduction studies may be used to demonstrate acceptable mitigation of risks identified during the risk assessments of individual components. At the end of the process qualification stage, sufficient data have been gathered to demonstrate acceptable risk of use for multiple disposables in a manufacturing process. Some of that information is typically presented as part of regulatory submissions for commercialization. Process changes both for disposable component manufacturing and for a drug manufacturing process can affect final product quality. A robust mechanism to track and assess changes will help ensure sustained quality over a product’s life cycle. The mechanism and details of vendor change notifications must be established up front as part of supplier quality agreements. That will ensure timely notification of changes to users from disposable vendors so that all changes are adequately assessed for their effects on manufacturing operations and product quality. Vendor notification needs to be incorporated into change-control systems at end-user sites. As part of continued process verification, relevant leachables testing also should be performed at routine intervals from high-risk points in the process. Previous risk assessments may be used to drivethe extent, frequency, and location of such testing. Testing and analysis of resulting leachables data can be incorporated into an existing continued process verification program to monitor a process for changes to risks associated with disposables. Individual and/or cumulative risk-assessment updates may be necessary to reflect changes made either to the manufacturing process itself or any disposable components used in it. Successful design, qualification, and maintenance of disposable technologies used in flexible facilities requires a validation program that incorporates evaluation and mitigation of risks inherent to disposables. The extent and duration of testing can be cumbersome and time-consuming, so it is important to incorporate disposable use early into the process validation life cycle. That will allow for data gathering and assessments as early as possible. Ravi Samavedam is a general manager at BioSPEQ Inc., 3200 El Camino Real, Suite 230, Irvine, CA 92602; 1-949-682-7003, fax 1-949-682-7004; rsamavedam@biospec.com; www.biospeq.com. He previously held roles in the quality, validation, and technical services departments at Shire HGT, Amgen, and Baxter BioSciences. 1.) Samavedam, R, A Goldstein, and D Schieche. 2006. Implementation of Disposables: Validation and Other Considerations. Am. Pharmaceut. Rev. 9:46-51. 2.) Mire-Sluis, A. 2011. Focus on Extractables and Leachables: Challenges and Strategies in Biopharmaceutical Development. BioProcess Int. 9:14-23. 3.) Norwood, DL. 2008. Best Practices for Extractables and Leachables in Orally Inhaled and Nasal Drug Products: An Overview of the PQRI Recommendations. Pharmaceut. Res. 25. 4.) 2010.Drug Product Containers and Closures Code of Federal Regulations, US Food and Drug Administration, Rockville. 5.) CBER/CDER 1999.Guidance for Industry: Container Closure Systems for Packaging Human Drugs and Biologics, US Food and Drug Administration, Rockville. 7.) ICH Q3B 2003. Impurities in New Drug Products. US Fed Reg. 68:64628-64629. 8.) ICH Q3C 1997. Guideline for Residual Solvents. US Fed Reg and 68(219) 2003: 64352–64353 62:67377. 9.) Lewis, DB 2011.Current FDA Perspective on Leachable Impurities in Parenteral and Ophthalmic Drug ProductsAAPS Workshop on Pharmaceutical Stability: Scientific and Regulatory Considerations for Global Drug Development and Commercialization, Washington. 10.) CBER/CDER/CVM 2011.Guidance to Industry, Process Validation: General Principles and Practices, Food and Drug Administration, Rockville.